I did not have high hopes for this Kushies Baby Ultra Lite Washable Diaper. I want to preface this by saying most experienced cloth diaperers have said they hate these and are glad they didn’t give up on Cd’ing because of them. I would really only suggest these to someone who wants to try cloth diapers that are easy & inexpensive. I’d rather have One Blueberry than 3 of these, but I’d rather have these than disposables. This was a new product at Kelly’s Closet. I still have a balance on the gift certificate my Mom got me for Christmas. I’m always looking to increase my fluff stash and try something new, plus I wanted to bump my order over $49 for free shipping. I was really intrigued by the price. This is the cheapest (mass produced) diaper I’ve purchased (aside from the econobum, which was free with a coupon code & I didn’t care for at all.) They were even cheaper than the smartipants diaper. 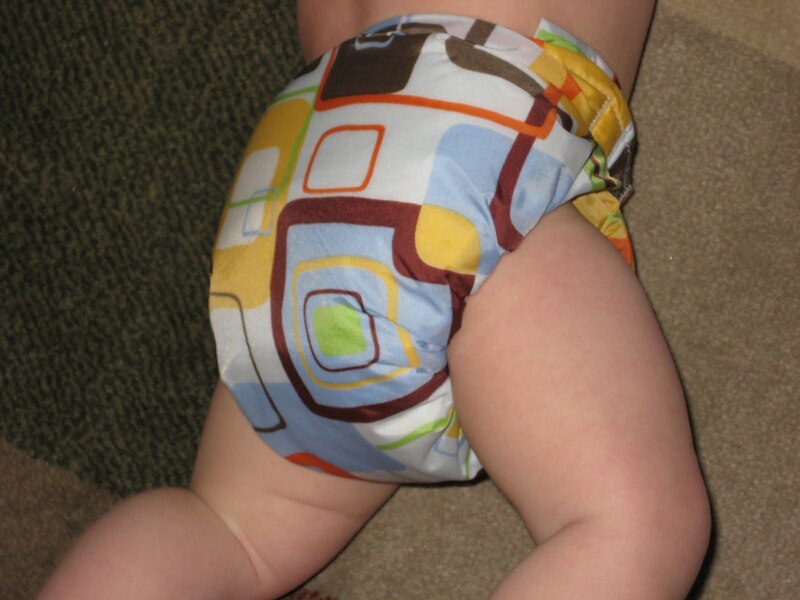 In addition, it is an all in one diaper, which means the soaker material is sewn into the diaper. I’m a little leery of them because of the drying time and inability to remove the soaker for extra cleaning. You get to choose boy, girl or neutral print, you don’t choose the actual print. I find that pretty disappointing since part of the fun of cloth diapering is choosing the cute fabrics! The one I received is OK. Not horrible but not what I would have chosen if I’d been able to. I’m not sure where I come up with this stuff, but for some reason, if it had been on clearance for, say, $8 or less, I would have been less concerned with the print. So, my initial opinion of the diaper wasn’t really great. The tabs were small and the outer fabric reminded me of a windbreaker. However, the diaper was really cushy and had a nice, thick absorbent core, which somehow also felt very, very trim. I also realized that the small tabs mean that you don’t have to have “overlapping” tabs, you can just put one below the other, since the loop part of the hook & loop was as wide as both tabs. According to their website, it has 6 layers of 100% cotton flannel plus a “special middle soaker for increased absorbency.” That soaker is just the fold down flap you can see in the photo. You can fold it over to get extra absorbency where you need it. This is the first diaper I have that doesn’t have a fabric against baby’s skin to wick moisture away. 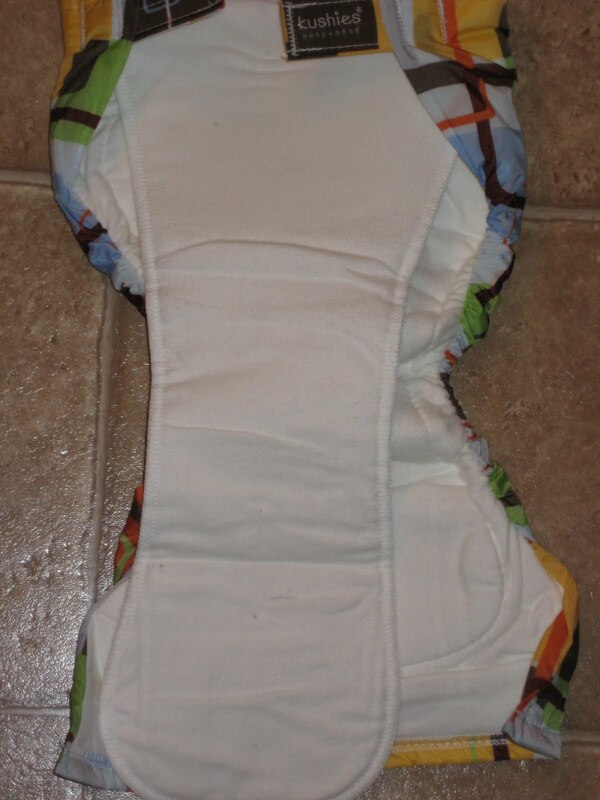 You can buy stay dry liners or buy and cut microfleece to line diapers with. These are also sized diapers. I chose infant (10-22 lbs) but they also offer toddler (22-45 lbs). I would probably continue to use the diaper as long as it continued to cover the important bits and not leak. The weight limits can really vary based on your child’s waist size, rise, skinny, chunky etc. The diaper was just fine on. The diaper doesn’t have any fancy gussets, but he pooped in it as well as soaking it, and we had no leaks or blowouts. I do wish it had a stay dry inner though, the whole inside was of course wet to the touch. The tabs held wonderfully and weren’t too grippy, yet they didn’t budge during laundering. I didn’t think I’d like this diaper, but it functioned very well, and when purchased in 5 packs, they are less than $10 per diaper. That is less than an econobum! These are very Daddy friendly. The fact that they are all in ones and have a velcro closure makes them as close to disposables as you can get. They are so affordable, you could try a few, use them long enough for them to pay for themselves, then move on to another type of diaper, or sell them or give them away! They are also readily available. I’ve heard people say they have seen them at Wal-Mart (Ptooie!!) and a quick search of their site confirms it. Free site to store shipping too. Bottom (no pun intended) line, these are cheap diapers that are fine for the price. Don’t buy them if you’re expecting Blueberry quality, but they’d be a great alternative to prefolds and covers or disposables. Now I’m really curious about the “Ultra” type. It says it has 5 layers of 100% cotton flannel (vs the Ultra-Lite’s 6, though perhaps that was a typo) plus the extra soaker. I love the adorable duck print pictured! These are also available in Preemie (2-4 lbs) and Newborn (4-10 lbs). That is definitely enticing since even one size diapers usually don’t fit well until about 10 pounds and it’s tough to think about investing hundreds of dollars in teeny diapers the baby won’t wear long! Edit August 2010: This is an OK diaper but very “cheap” and won’t really hold up to “messes.” If you’re on a budget, I’d suggest a Hybrid or prefold/cover system before I recommended these. Ha! Like you I initially had really low expectations for these diapers. AIOs…meh… Walmart… double meh… but I’ve been convinced lately because they’re the ONLY cloth diapers the ladies at dd’s daycare will touch. At $10 a pop they do their job as spares and handouts. Plus it’s still better than disposables. I suspect they are fantastic for daycare providers because they go on and off just like disposables and really, they’re pretty trim too. If you haven’t used diapers 2-3x the price then you wouldn’t know the difference! Also, did you end up purchasing the ultras w/the duck print? If so, how do they differ from the ultra lites? Getting to your post a year later… just wanted to agree – kushies ultra lites are awesome! Getting ready to spend my amazon gift card on the bigger size since little one is popping out of the infant size, at 6 months/18 pounds – eek!